1. physical touch 2. quality time 3. words of affirmation 4. gifts 5.acts of service. 1. Quality time: This is our number one love language, and it’s evident. We’re famous (some may say infamous?) for scheduling in-person coffee meetings! At the root of it all, we value people and want to be able to express our appreciation for their time, critical input, collaborative ideas, and downright existence. We express this best by doing so with some old-school facetime. 2. Gifts: There are very few people in this world that DON’T enjoy receiving gifts, especially surprise gifts! 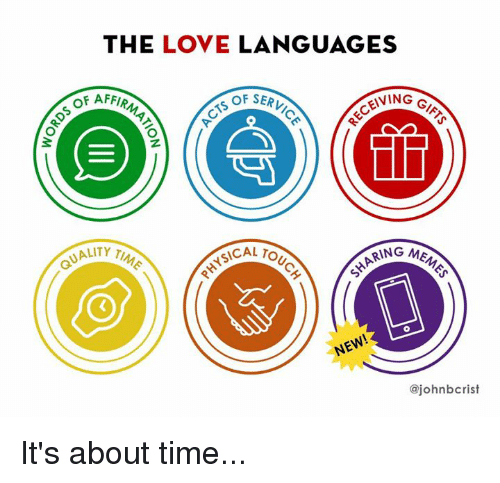 In business, gifts (within typical HR regulation, of course) are an openly accepted “love language.” Think less brown-nosing, bribery type gifts, and moreso gifts of appreciation and recognition. The best gifts are the unexpected ones, so don’t wait until the holidays or special occasions to let your clients and customers know you’re thinking of them. For example, we send handwritten thank you notes to all our event-day vendors after every event production. It’s our signature (hehee, get it?) way of saying “You rock, don’t ever change! If you’re planning on taking your business worldwide… and you should be… keep in mind that, in other cultures, their handshake equivalent may be other forms of physical touch or body language, such as a kiss or bow. Don’t count out this business love language for fear of being too personal. Your avoidance of any physical gesture can very well come across as cold or rude, or even worse, unwilling to do business. We think it’s safe to say most people are comfortable starting business interactions with a handshake and ending with another or cordial hug. 5. Acts of Service: Has your significant other ever filled your gas tank or folded the laundry you left in the dryer without you having to ask? If you can relate, you know how wonderful that feeling is when someone does something practical to show they’re thinking of you. The same can apply for business. Going the extra mile, or even just the extra step, for a client can be the difference-maker in ensuring future business – and those much-appreciated referrals! This love language can be communicated by way of discounts on fees, walking your business partner’s dog, or taking on part of the project you know your colleague is struggling with. In your shared workspace, making a fresh pot of coffee around the 3 PM afternoon lull will get you major brownie points with your peers, only costing you 2 minutes of your free time. Acts of Service is a love language that doesn’t have to take much time, effort, or money, but show that you were thinking of someone in a caring manner. It’s in our female nature to be loving and expressing such via acts of service are a great way to ensure even greater business success!